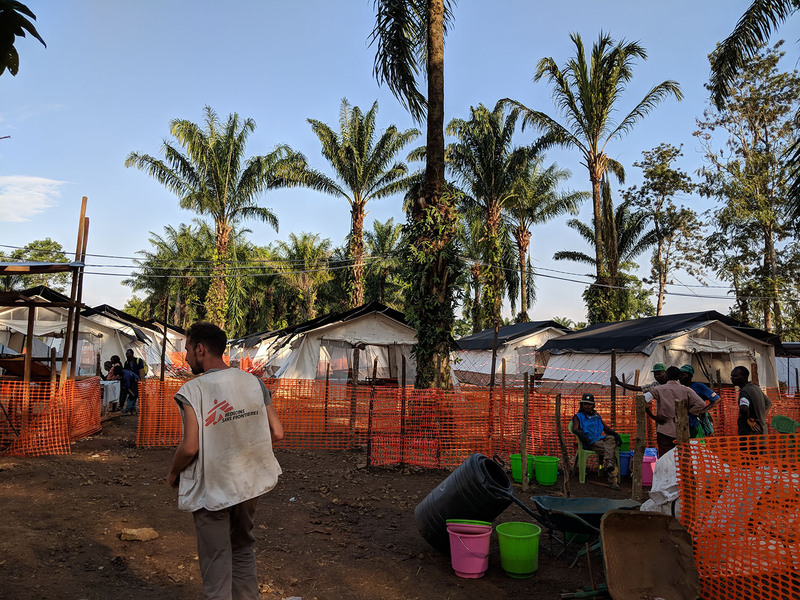 Taking a new step in its response to the current Ebola outbreak in North Kivu, Democratic Republic of Congo, Médecins Sans Frontières (MSF) opened a treatment centre on Tuesday 14 August in Mangina, a small town considered to be the epicentre of the outbreak. 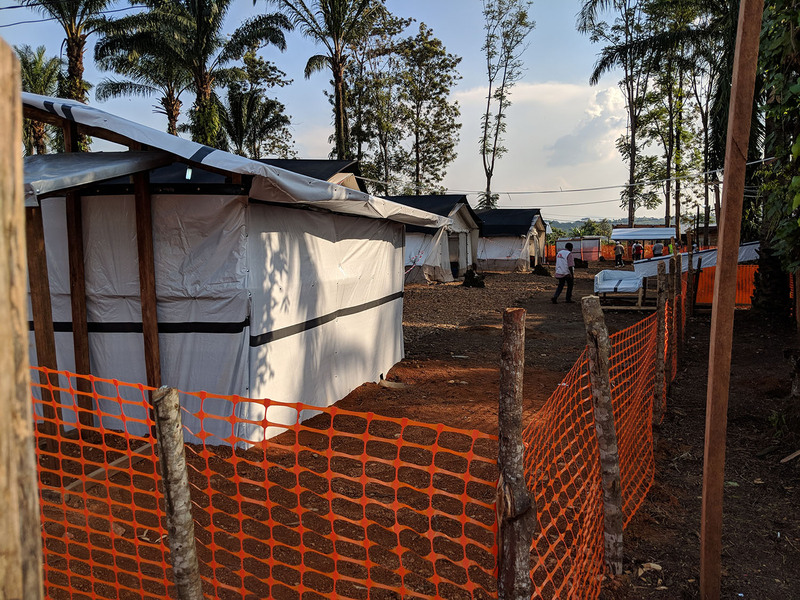 All patients from the isolation unit where MSF was working to improve biosafety have been transferred to the twelve tents of the new Ebola treatment centre. A total of 37 patients are currently hospitalised – 31 of them have been confirmed to be infected by the virus by laboratory tests, while the others are classified as suspect cases. The virus has already killed 41 people, according to the Ministry of Health. Addressing some of the priorities set out in the overall response plan of the health authorities, MSF is also active in support of the local health infrastructure. In Ituri province, an MSF team is working on the route between Mambasa and Makeke, on the border with North Kivu, visiting health centres to set up isolation rooms in case of need, undertaking surveillance activities and working with community health workers to raise awareness around Ebola. Infection prevention and control protocols are being reinforced to ensure continuity of care for non-Ebola patients – a critical pillar of the outbreak response. For the same reason, the organisation is working to keep the several existing projects it runs the area safe from the risk of contamination, thereby continuing to provide much-needed medical services. A vaccination programme is being run at present by the Ministry of Health with the support of the World Health Organisation in the area most affected by the outbreak. And almost 1,200 contacts have been identified so far according to the Ministry of Health. North Kivu, where the outbreak was declared on 1 August, is one of the most unstable areas in the region. Ongoing conflict and heavy military intervention have resulted in a high number of displacements, worsening the chronic problem of limited access to healthcare. Large movements of population can happen suddenly in response to an outburst of violence. These aspects of the context will have a significant impact on the humanitarian response. Critical activities that typically require the ability to reach remote locations, such as contact tracing, community outreach, surveillance, alert investigation, vaccination and health promotion are inevitably affected by the practical limitations imposed by. In neighbouring Uganda, MSF is part of the national task force to ensure effective preparations are in place to tackle the risk of cross-border contagion.